There are huge text books addressing the surgical repair of fractures in dogs, cats, and other animals. 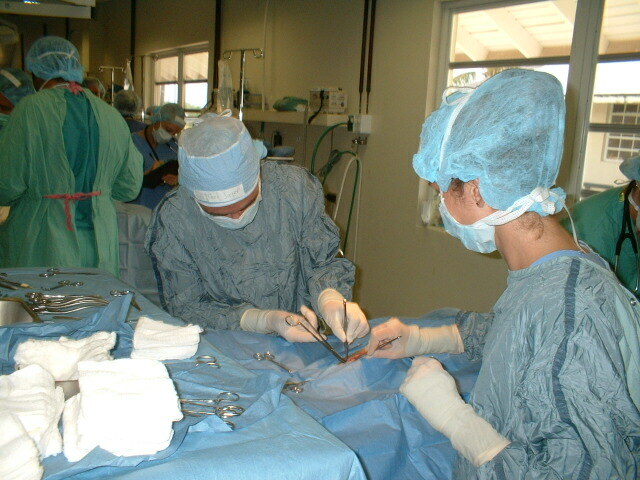 Remember that on this page I am making just a few comments, hopefully pertinent, about each of the different types of surgery we veterinarians do on a routine basis. 1. Initial Examination. Sometimes a fracture is obvious; sometimes not. Often there is more damage and more fractures than are at first obvious. Often there is shock, pain, fear, panic, and other problems to deal with in addition to the fracture. Expect some discussion on the expense of properly fixing a fracture...some people seem to think that all we do is put on a splint and the pet will get all better. That is sometimes true for minor fractures of the lower limbs and tail, but most other fractures require hospitalization, radiographs, surgical implants, surgical reconstruction, special antibiotics, IV Fluids, and several weeks of post operative medication and attention. Sometimes it's necessary to undergo future surgery to remove the implants. Referral to bone specialists who have both the experience and surgical implant (bone plates, screws, rods, and applicators) equipment is often involved. At any rate, you need to know that the surgical repair of fractures can cost several thousand dollars. A bargain compared to similar procedures done in human medicine, but still more than what many people expect. 2. Repair of open wounds to the skin and muscle often need to heal first if a cast or splint is going to be employed. And, of course, the patient is treated for shock and pain and made stable prior to doing much about the fracture. There's also the important detail of making sure the nerves near the fracture site weren't permanently damaged. 3. Radiographs are usually needed in all but the most obvious and distal of fractures. 4. In order to get acceptable bone healing, the surgeon needs to get fairly fresh, non-infected bone fragments back in alignment and immobilized long enough for healing to take place. He or she might use a splint, external fixation, or internal plates, screws, or wires.... or any combination of the above.  There are even surgical bone glues, pastes, and bone grafting composites that some surgeons use. How long healing takes and how successful it will be depends on the individual patient, the extent of the tissue damage, control of infection, the quality of the blood supply to the injury, the tolerance of the patient for whatever is used to immobilize the fracture, and the willingness of the owner to follow instructions during the healing process. All these factors are important, but the big deal is getting the bone pieces back together again and immobilized. 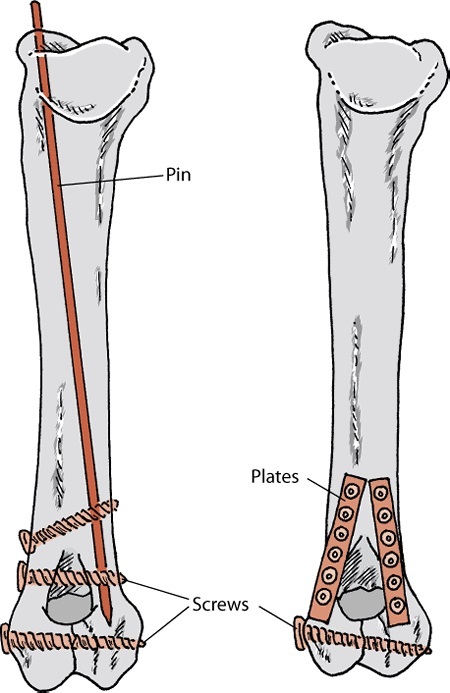 If major bones are involved, just splinting or casting are usually NOT good enough...there are too many shearing, twisting, slipping, sliding, and compression forces affecting the bone ends for tissue bonding to take place. This problem has been solved, for the most part, with various implant devices (screws, wire, plates, and pins), which usually work quite well. The skills and equipment needed to do a good job are considerable though, so many general practioners refer major bone cases to Orthopedic specialists. I do. 5. Bone infections can be tough to treat, bone surgery (and anesthesia) is often a long procedure, and both the trauma from the injury and the surgery are considerable, so expect your veterinarian to perform pre-anesthetic blood work, give pre-surgical antibiotics, and run IV fluids. Bone fractures are especially painful, so expect some heavy duty post op pain medication. 6. It's critical that the recovering fracture patient rest and minimize self-mutilation and abuse of the fracture site. Expect some trouble and effort caring for your pet during this time and count on having to return to the vet for rechecks, adjustments to the treatment plan, and reinforcement of the immobilization splint, cast, or bandage. I didn't mention jaw fractures specifically, but, of course, expect to feed special diets in this case. 7. There is some professional controversy now about how long a fracture should be immobilized and some vets are now recommending post op physical therapy by trained therapists, so expect some slight differences in opinion if you talk to multiple vets. 8. 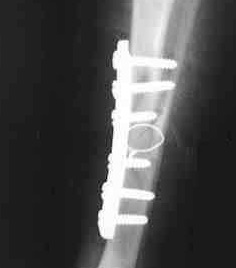 At any rate... proper fracture repair can be a major undertaking. Hopefully you love your pet as much as you say you do and take your responsibilities as a pet owner seriously.